Six months a year: Blizzards; never ending bitter cold; sub zero wind chill factor; shoveling; zero visibility; roads closed; more shoveling; ice scrapers and snow brushes; plows burying cars and driveways; ice storms; hats, gloves, boots, scarves, parkas; dead car batteries; AAA emergency road service; road salt eroding cars; power outages; being stranded; and unplowed roads. Living under these conditions for nearly 50 years, my husband and I decided enough was enough and relocated from Buffalo, New York, to Henderson, Nevada, where the warmth of the sunshine paints the daily landscape. Accompanying us on our cross country journey to the land of sunshine were our two German shepherds, Duke and Shelby. Once situated, I resumed my breeding career with Duke and Shelby and found a genuine reception amongst the residents of Nevada. People grew increasingly interested once they discovered an expert breeder within their midst; one with honest breeding ethics and a solid reputation. No longer needing to travel to California, Arizona, or Utah to find quality German shepherd pups was an added bonus. With over 10 years breeding experience, I have decided it’s time to share with others the wealth of knowledge and the secrets I have learned over the years to excel at breeding. My experience applies to breeding most large breed dogs, not just German shepherds. This is a rewarding career path, filled with an abundance of love. 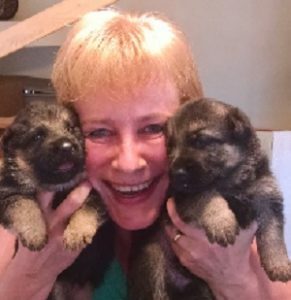 Join me on this journey and go from a novice breeder to an expert breeder, just like me: Virginia Clark. I am inspired to share my experiences as a licensed breeder with others. During my 10+ years as a successful breeder, I have learned how to excel at breeding. The novice breeder can become an expert breeder by reading my step-by-step guide that is filled with hundreds of pictures, video links, and so much helpful information. This book was a joy to write because I am a passionate breeder and love puppies so much that the words flowed with ease. The writing process for me was easy because I am very well informed on the subject of breeding. Writing non-fiction is very different from writing fiction. My writing reflects years of hard work and dedication in the field of breeding. Find a subject that lights up your mind! Then get busy! After reviewing my final version of my manuscript, I was so delighted with the outcome that I knew I had to publish the book. I wanted to read a printed copy knowing I might find a hard copy helpful in finding possible errors, so I went to the copy store for a printing. This day proved positive because a publisher just happened to be at the store at the same time. She took a look at the manuscript and wanted to have a copy to review. Two days later she called and said wanted to publish my book because she said “it was the best rough draft she ever read” ! The book publishing arena is very competitive. It is difficult for an unknown author to gain recognition. It takes so much hard work and dedication to get a book noticed. The internet is the lifeline towards having a successful book. I would be helpful to have a more streamlined avenue to follow to gain a strong online presence.